Ian Juby hails from Eastern Ontario, Canada. Inspired by Dr. Carl Baugh and the Creation Evidence Museum, he came back to Canada and set out to build Canada's first Creation Museum, the Creation Science Museum of Canada. Because of the predominantly rural Canadian culture, he has kept the museum traveling, with intentions on building a future, permanent museum. He builds museum displays for Creation museums and acts as a consultant. His displays can be seen in several Creation museums around North America including Canada's largest traveling Creation museum owned by Vance Nelson, as well as at the Big Valley Creation Science Museum, Canada's first permanent Creation museum, and at the Creation Science Centre in Cornwall, Ontario Canada. In the US, his displays can be seen at Kent Hovind's Dinosaur Adventure Land, the Akron Fossils and Science Center in Ohio, Creation Evidence Museum in Texas, and in the future Creation museum of Paul Veit in Maine. He has been a regular on "Creation in the 21st Century", an internationally broadcast Creation Science television show produced by TBN. He has spent considerable time and research at the Joggins Fossil Cliffs in Nova Scotia and considerable first hand research, primarily in geology. He is the producer of what will hopefully become a weekly Canadian Creation Science show called Genesis Week. 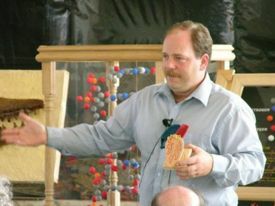 He is the founder of the International Creation Science Special Interest Group for Mensa members, and a sustaining member of the Creation Research Society. This page was last modified on 14 April 2014, at 17:38.